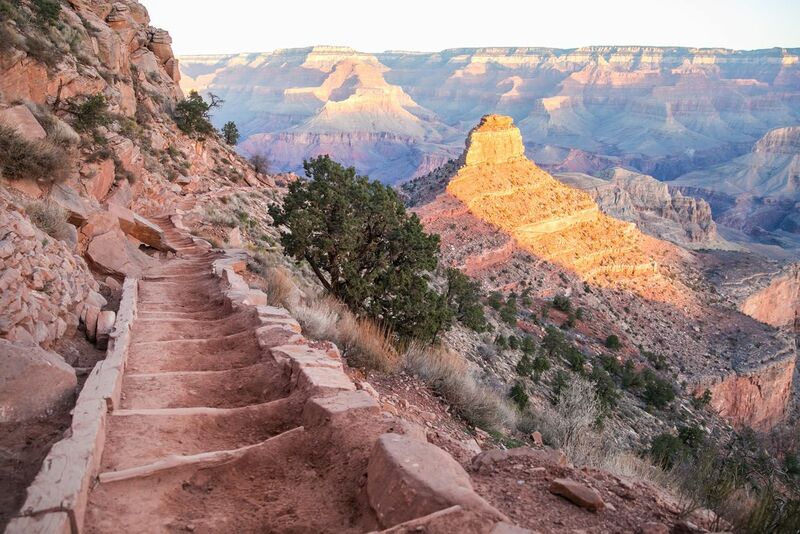 The South Kaibab and Bright Angel Trails are two of the Grand Canyon’s classic hiking trails. You can combine these two trails together to create one massive day hike or a two-day backpacking trip. 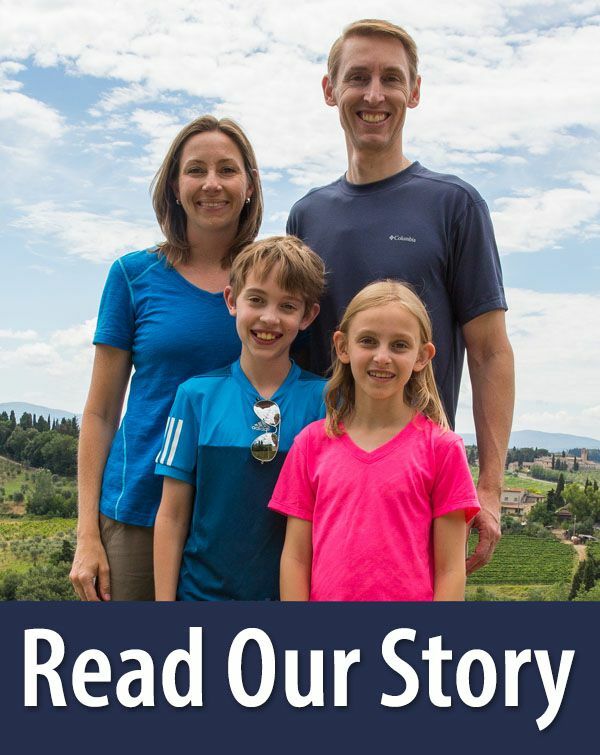 It is a long, challenging hike but it makes for some incredible memories. With its long distance and nearly a mile of elevation gain, this is a beast of a hike. However, there is something very special about starting on the rim, hiking down to the Colorado River, and then working your way back up to the rim. 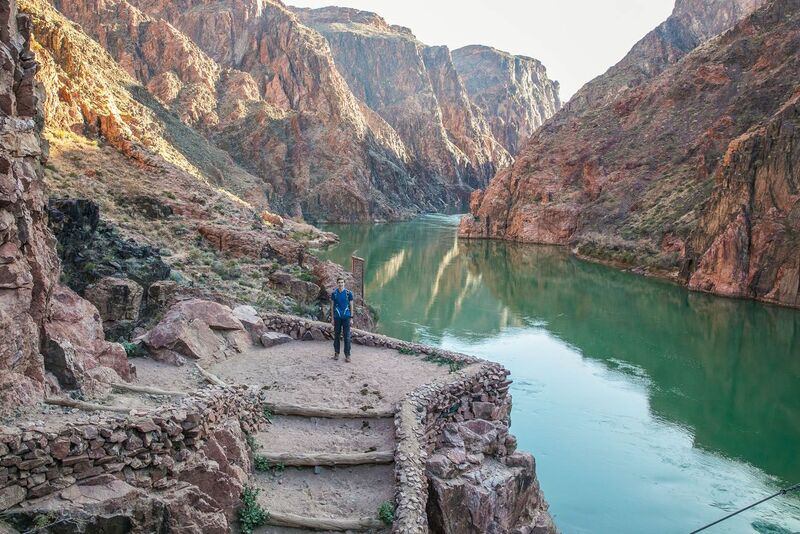 If you are up for an adventure, this hike is one of the best ways to truly experience the Grand Canyon. How Hard is This Hike? The “true” rim-to-rim hike is the hike from the North Rim to the South Rim (you can also do it as South Rim to North Rim). 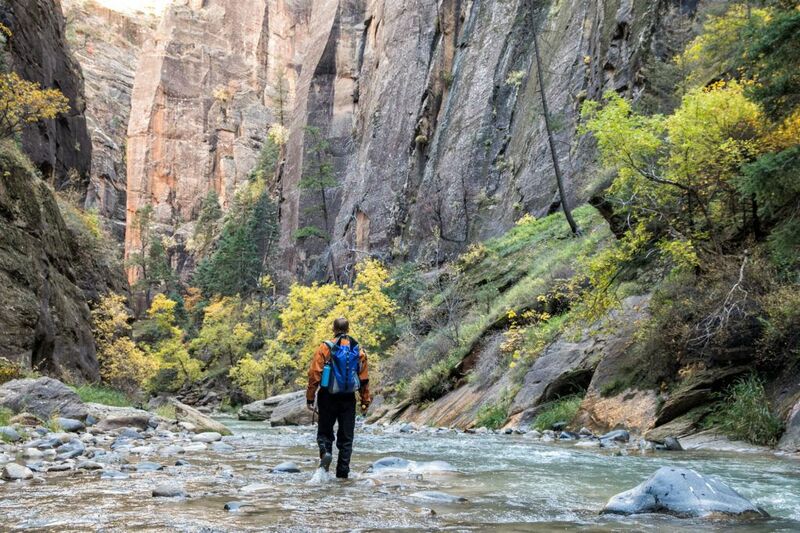 This is a 24-mile journey that most people do as a two-day backpacking trip. It is possible to do it as one mega day hike if you are extremely fit and fast. 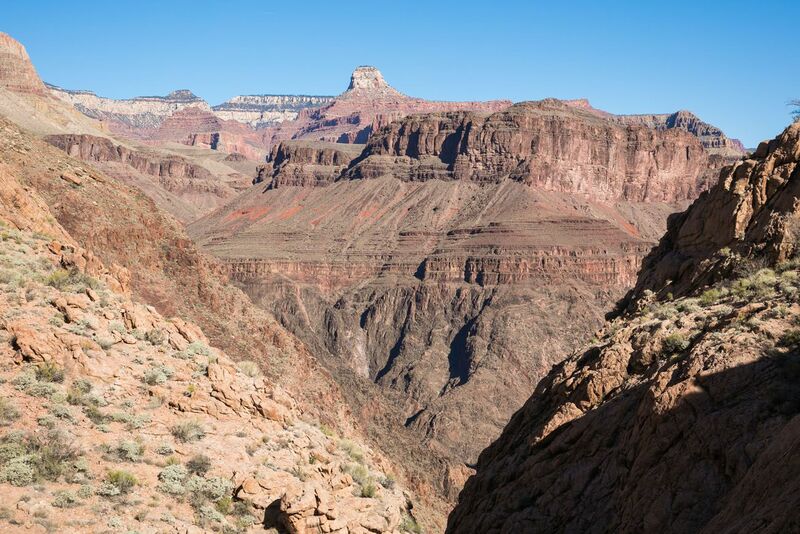 If you hike the South Kaibab and Bright Angel Trail (or vice versa) you are also hiking rim-to-rim, since you start on the rim, hike to the Colorado River, and then hike back up to the rim. 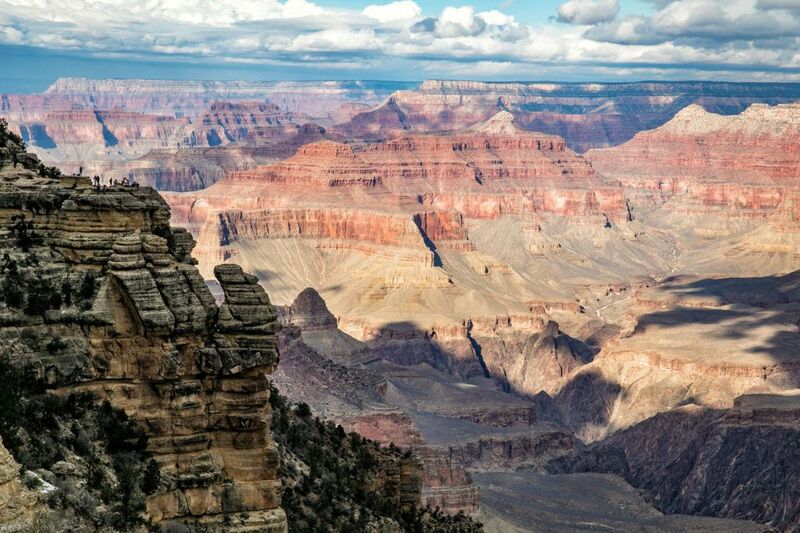 However, when people refer to the rim-to-rim hike, they are referring to the North Rim to South Rim hike. 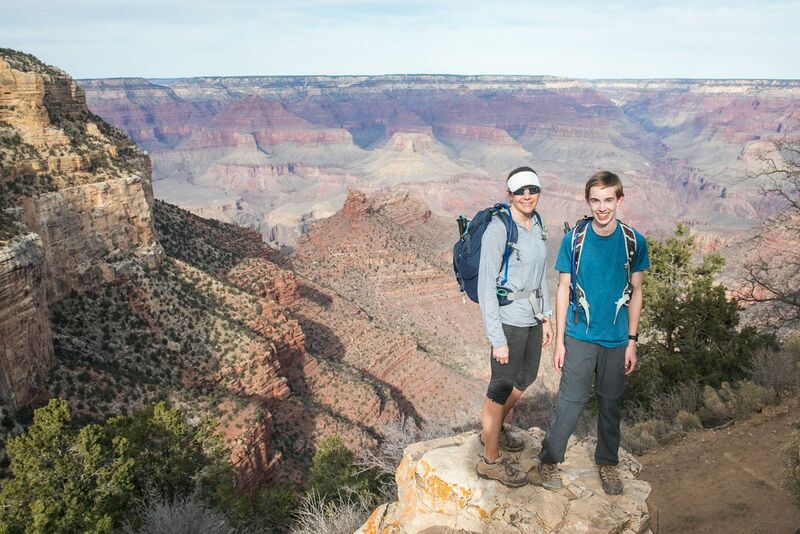 The south rim-to-rim hike has several advantages that make it a nice option for many people. For one thing, it’s a heck of a lot shorter…7 miles shorter. 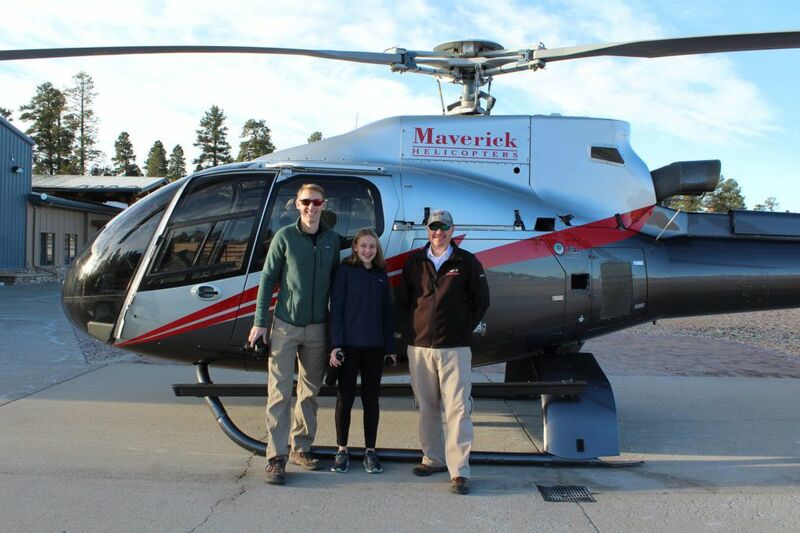 Since you start and end on the South Rim, you do not need to arrange a shuttle service to transport you to the North Rim. And finally, snow closes the road to the North Rim for half of the year, so there is just a short window of time that you can get to the North Rim by car. This information is for the hike on the South Kaibab Trail to Bright Angel Campground to the Bright Angel Trail. 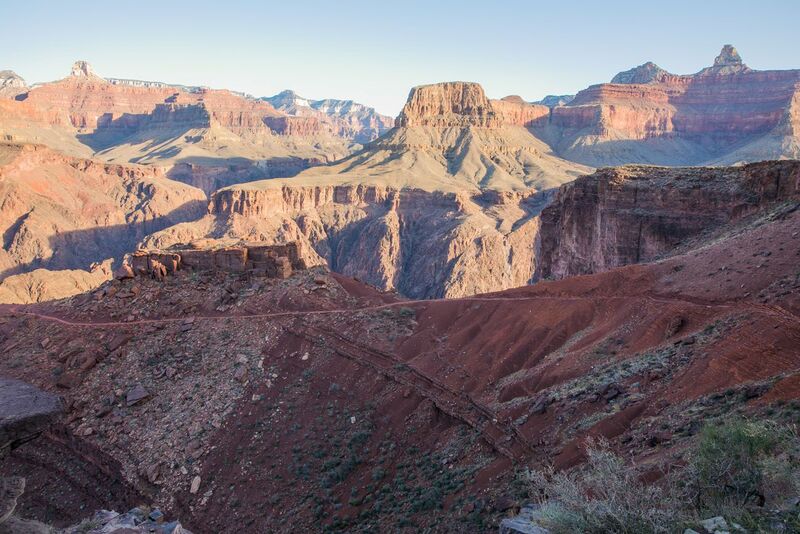 Elevation Change: 4780 feet loss (to the Colorado River) and 4380 elevation gain (Bright Angel Campground to the South Rim on the Bright Angel Trail). As a reference, there are 5,280 feet in one mile. When To Go: This can be done year round, however, summer is the worst time to do this hike. Temperatures can soar, and with the heat, this can be a dangerous hike. Fall and spring are ideal. Winter is very pleasant but snow can make the trails slippery and dangerous. The hiking distances and elevation data in this article were taken from the National Park website. Map of the South Kaibab and Bright Angel Trail. 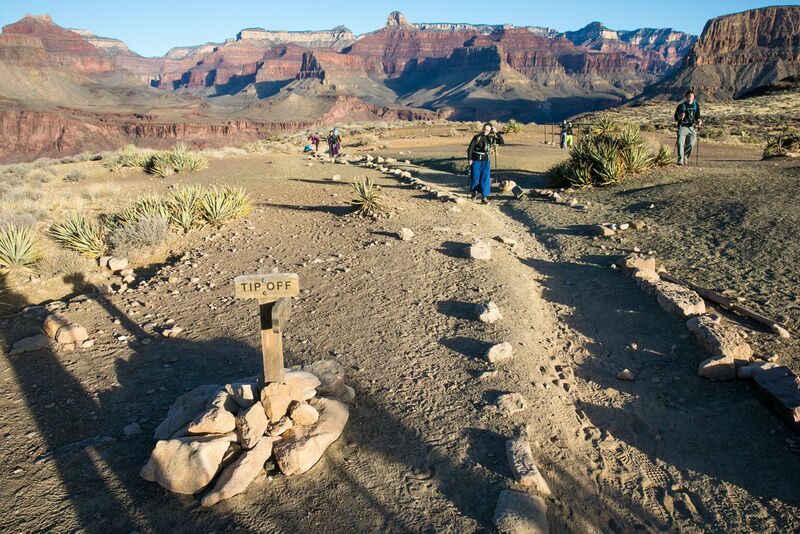 The South Kaibab Trail is red and the Bright Angel Trail is blue. Before we go any farther, you should know that the National Park Service does not recommend doing this as a day hike. 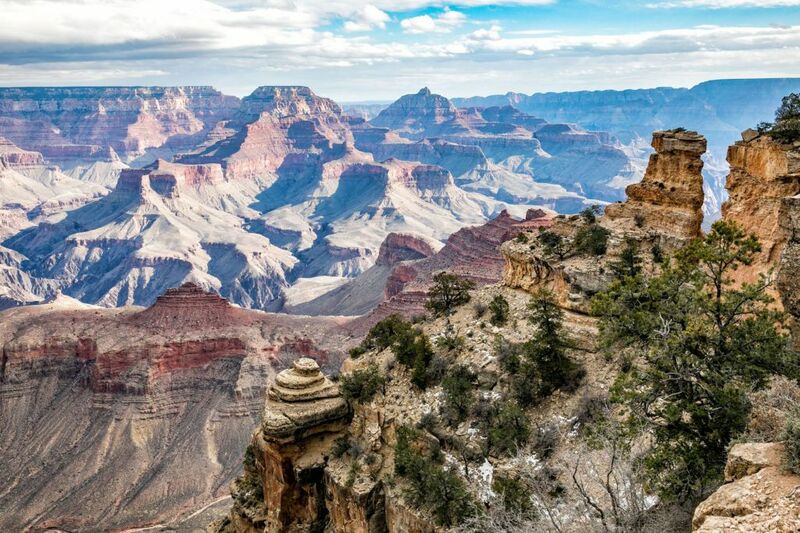 There are numerous warnings on the Grand Canyon National Park website telling people not to hike the South Kaibab and Bright Angel Trail as a day hike. There are also signs posted at the trailheads to discourage people from doing this as a day hike. 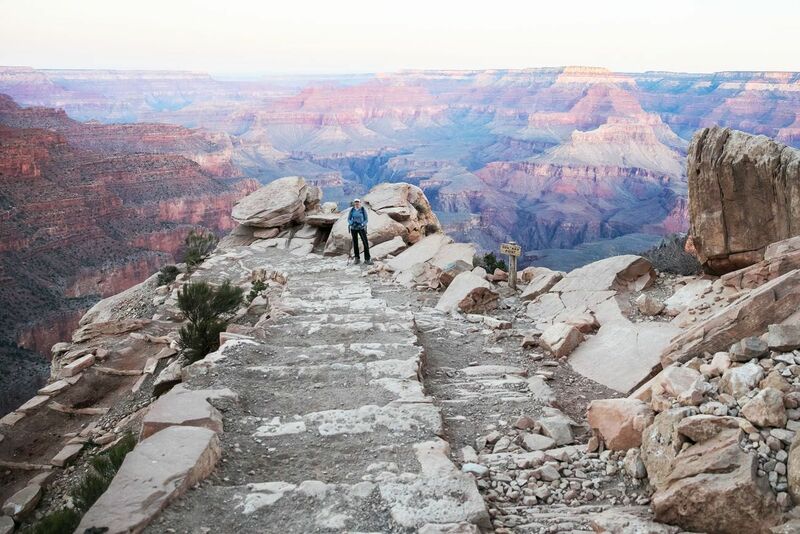 Even so, many people hike the South Kaibab and Bright Angel Trails in one day. In order to do this as a day hike, you need to be fit and fast and know what you can handle. Park Rangers make many rescues per year for people who get in over their heads. 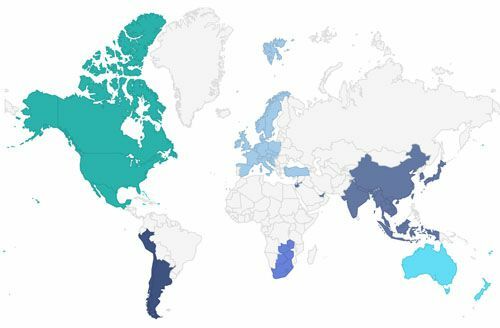 Don’t be one of these statistics! The trailhead is located near Yaki Point. The best way to get to the trailhead is to take the free Grand Canyon shuttle from the Visitor Center directly to the trailhead. The shuttle is called the Hiker’s Express Shuttle Bus. The hours of operation change throughout the year, but in general, the first shuttle is 5 am during the summer months and 7 am during the winter months. 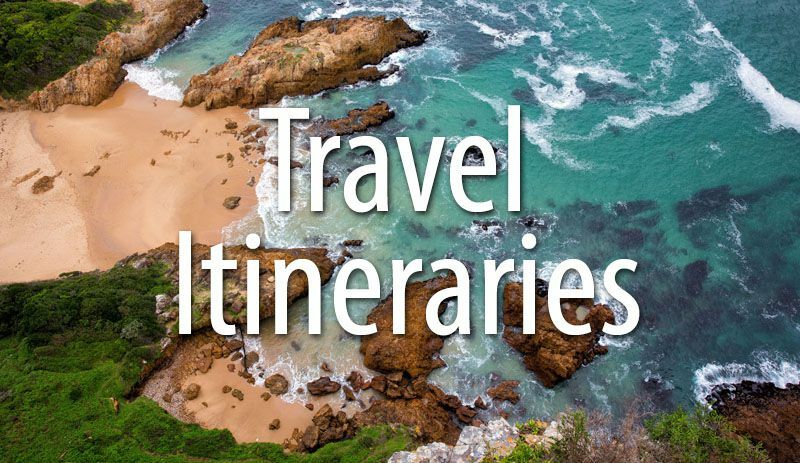 Click here to see the updated shuttle schedule. You cannot drive to the trailhead. The road to Yaki Point and the South Kaibab Trail is for shuttle buses only. If you want to skip the shuttle, there are a few parking spaces on Desert View Road. From here, it is roughly a half-mile walk to get to the trailhead. Don’t forget that later in the day you will need to get back to your car. Pro Travel Tip: If you are doing this as a day hike, we recommend starting the hike no later than sunrise. This gives you a full day of sunlight (which is quite brief during the winter months) to complete the hike. During the summer months, this early starts allows you to hike a portion of the trail before temperatures really heat up. 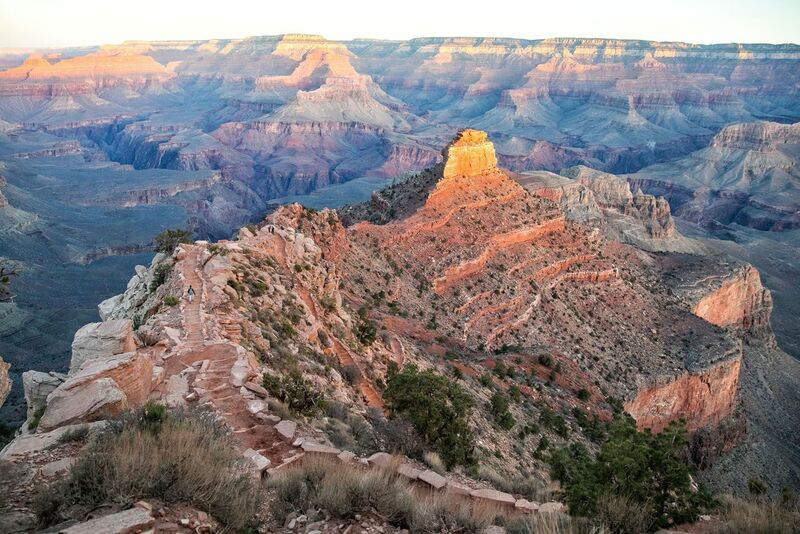 As you hike down the South Kaibab Trail, there are several landmarks along the way. Here are their elevations and distances from the South Kaibab Trailhead. From the rim to the Colorado River, it is essentially a downhill walk the entire the way. There will be a few, brief sections where you walk uphill, but honestly, this gives your legs a nice break from the constant downhill pounding they take. By the time we reached the Colorado River, I was thrilled to finally walk on level ground again. Sure, walking downhill can be fast, but it really does tire out your legs. We started at 7:15 am. It took us two and a half hours to hike to the Bright Angel Campground. We were moving fairly fast but I also stopped a lot to take photos. The views on the South Kaibab Trail are more spectacular than those on the Bright Angel Trail. 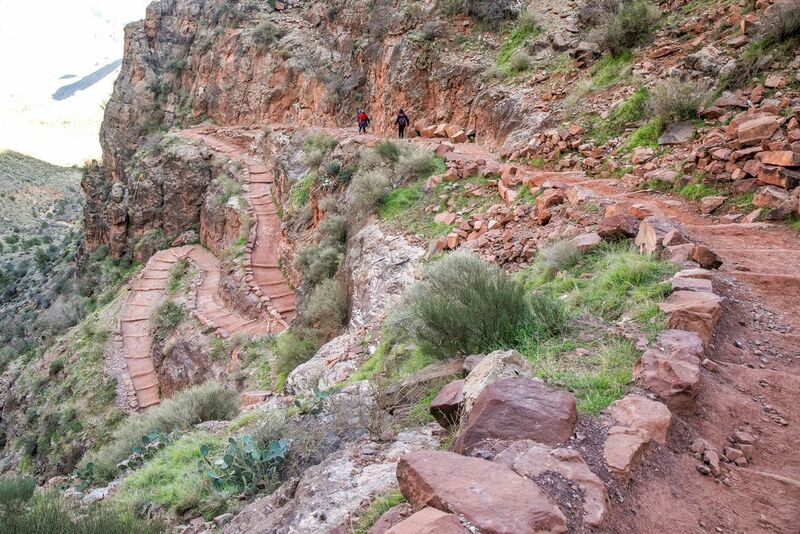 The first section of the South Kaibab Trail is the steepest and most strenuous. For one mile, a series of steep switchbacks descend below the level of the rim. Pro Travel Tip: If you are doing this hike in the winter months, be prepared for ice on the trail. During our visit in late December, there was ice on the top part of the South Kaibab Trail. Hiking poles can help on these slippery surfaces and we saw some people using crampons. The views are great all long the South Kaibab Trail but Ooh Aah Point gives you your first panoramic view of the Grand Canyon. And isn’t this just the best name for a viewpoint? Ooh Aah Point sits at 6660 feet, which is 600 feet under the rim. 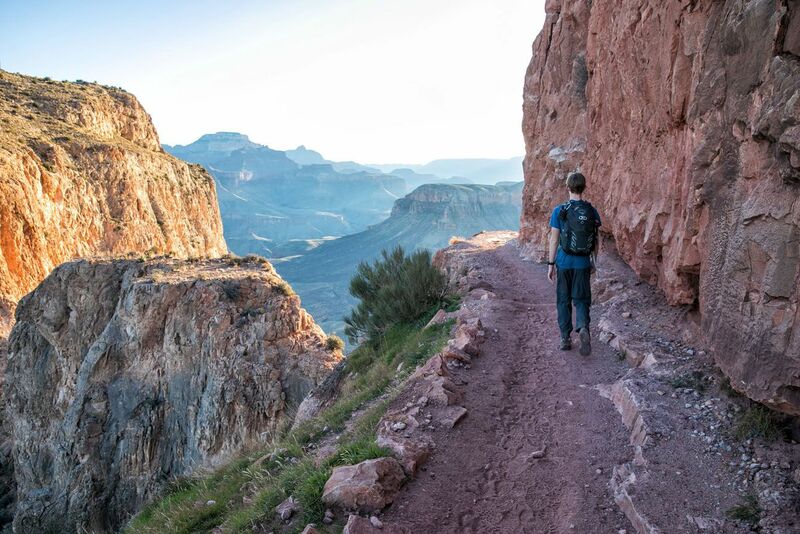 Stretching out in front of you is the South Kaibab Trail, the Tonto Plateau, and the colorful layers of sedimentary rock that makes the Grand Canyon so beautiful. 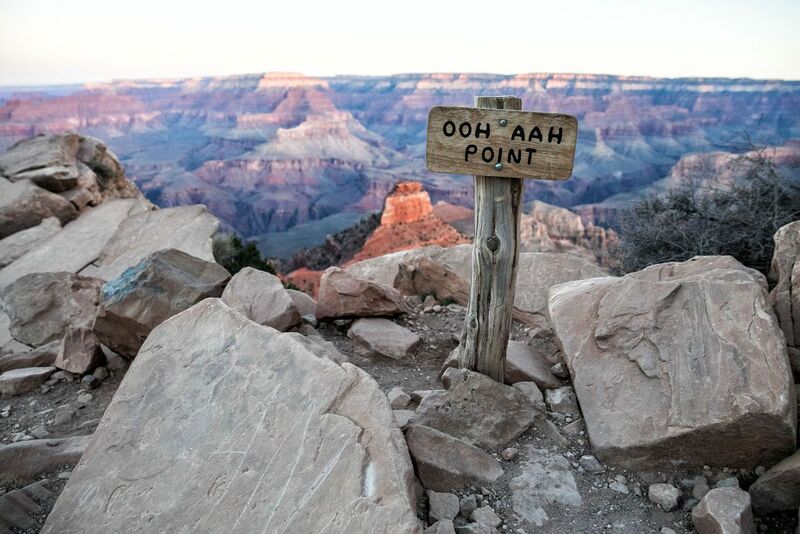 From Ooh Aah Point, you pass to Cedar Ridge. There are toilets here but no water. The views keep changing as you hike to Skeleton Point. However, you still cannot see the Colorado River. This is the point where the National Park Service recommends that you turn around if you are day hiking the Grand Canyon. The section between Skeleton Point and the Tip-Off was one of my favorites of the hike. You have to descend a series of switchbacks again, but the sweeping views across the Grand Canyon are some of the best of the day. The Tip-Off is located on the Tonto Plateau. The Tonto Trail intersects the South Kaibab Trail at this point. This is the final landmark until you get to the Colorado River. From here, it is one final, steep descent to the Colorado River. Another series of switchbacks takes you from the Tonto Plateau to the Colorado River. By this point, my legs were starting to feel fatigued. As much as I was not looking forward to the massive climb, by the time we got to the Colorado River, I was thrilled to not be walking downhill anymore. This part of the Colorado River sits at 2480 feet. Temperatures can average 10 to 20 degrees warmer here than on the rim. During the winter months, the river can be a brilliant green, like you see in these photos. However, for most the year, the river is usually brown from sediment in the water. 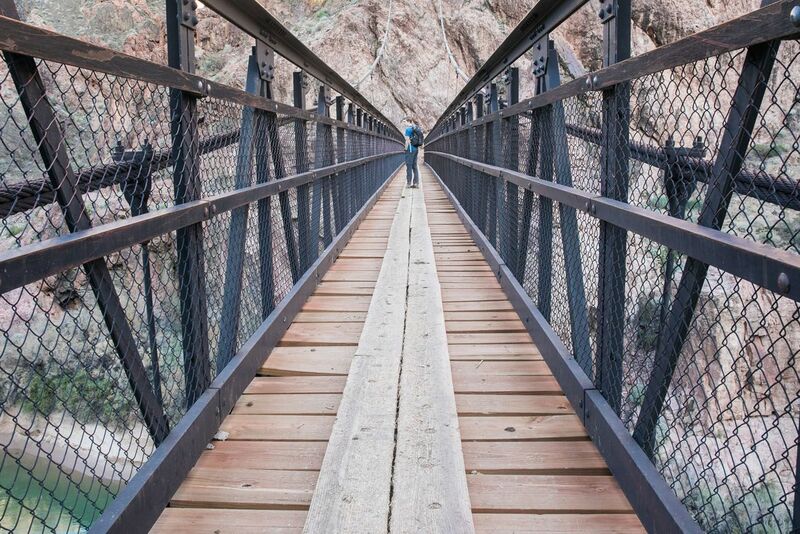 Cross the Kaibab Suspension Bridge and then it is just a short walk along the north bank of the Colorado River to the Bright Angel Campground. Here you have access to toilets and water. We spent a few minutes here to use the toilets and have a snack before setting off again. 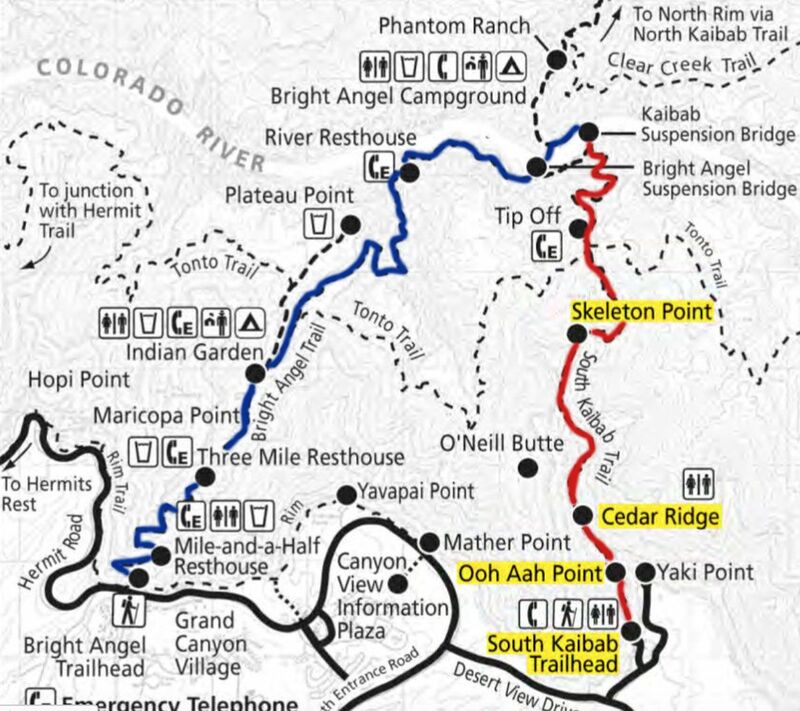 The Bright Angel Trail is longer than the South Kaibab Trail. But with less elevation gain over a longer distance, it is slightly less strenuous than the South Kaibab Trail. There are also restrooms and access to water along the way, so many people choose to hike up the Bright Angel Trail for these reasons. 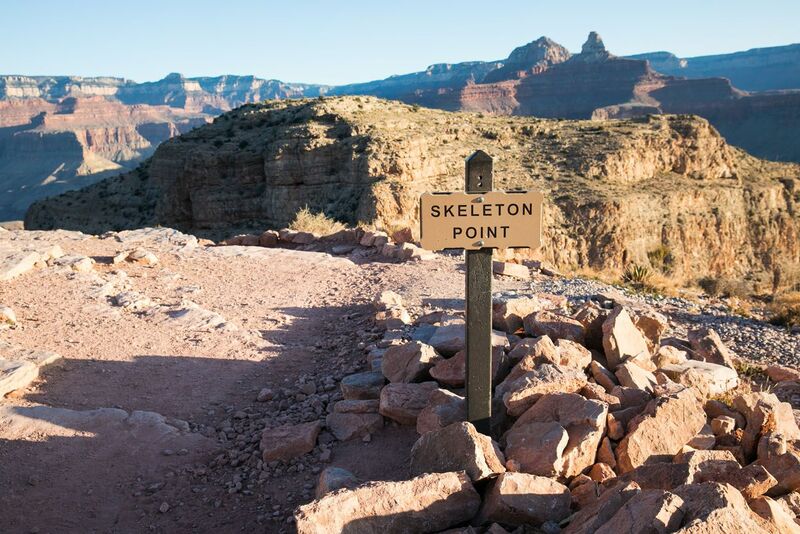 As you hike up the Bright Angel Trail, there are several landmarks along the way. Here are their elevations and distances from the Bright Angel Campground. Cross over the river at the Bright Angel Suspension Bridge. Enjoy the one-mile, almost flat walk until you get to the River Resthouse. At this point, the trail turns away from the river and now the real fun begins. It’s time to start the climb back up to the South Rim. From the River Resthouse to Indian Garden, it is a 3.2-mile walk. At first, you hike along a small creek. The trail steadily gains elevation but it is really not too bad. 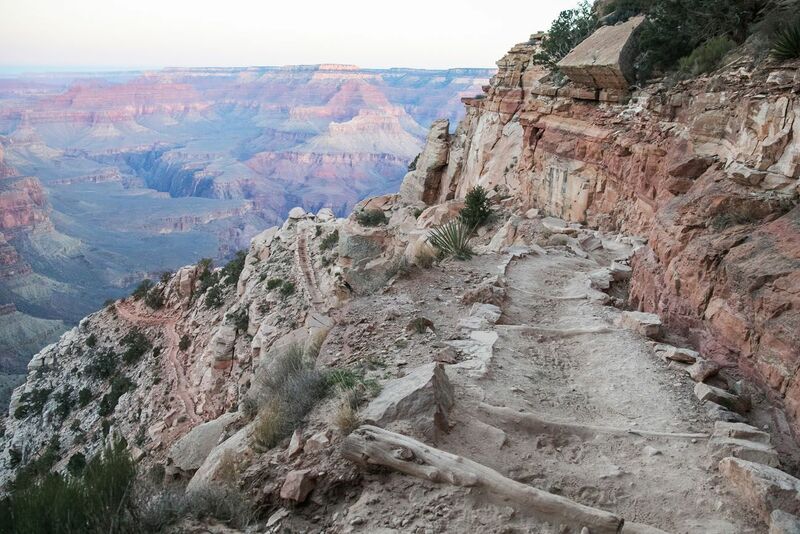 It’s a pretty walk but since you are in a canyon, you do not have the same sweeping views like you get on the South Kaibab Trail. Eventually, you come to your first series of switchbacks. They don’t last long but they can be tiring and this is a nice preview of what is coming at the end of the Bright Angel Trail. The views open a little bit more. Once at Indian Garden, you have access to potable water and restrooms. From Indian Garden, it is just 4.8 miles to the rim. Doesn’t sound so bad, right? But then you look up at the rim and it’s just a giant wall of rock. It looks nearly impossible to hike up it. I had this weird combination of excitement and dread for what was still to come. But not Tyler. He was still smiling and full of energy. 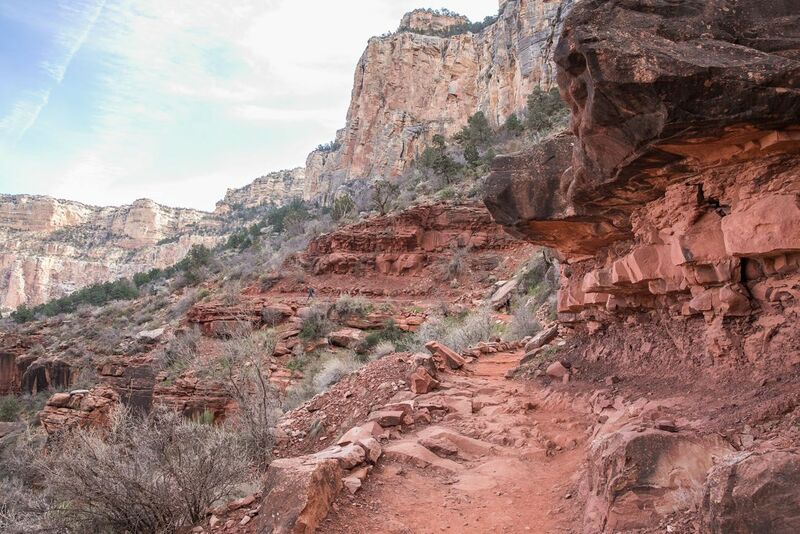 Once you get to 3 Mile Resthouse, appropriately named since it is just 3 miles from the end of the Bright Angel Trail, you are really feeling the climb. By now, you have already started winding your way up the switchbacks. Your thighs are burning, your lungs are burning, and most likely, part of you is wondering why you ever thought that this was going to be a fun thing to do. The final three miles is killer. 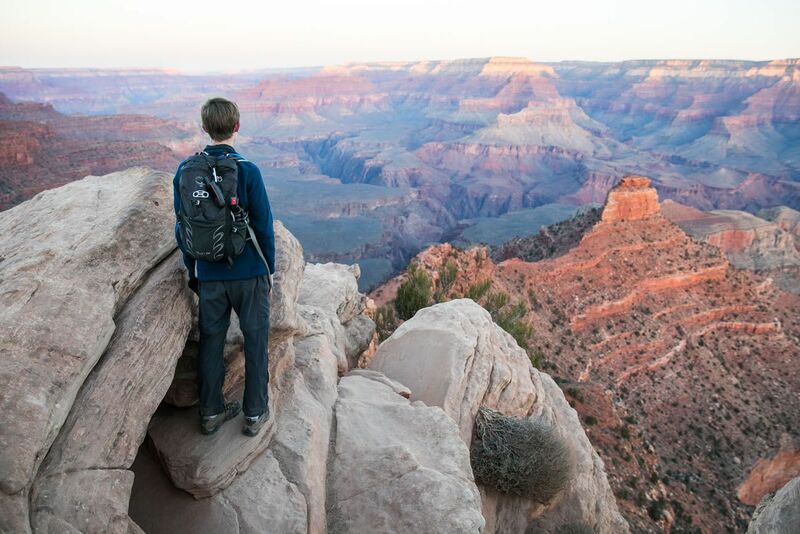 Take frequent breaks and even though you might not care anymore, try to enjoy the view across the Grand Canyon. 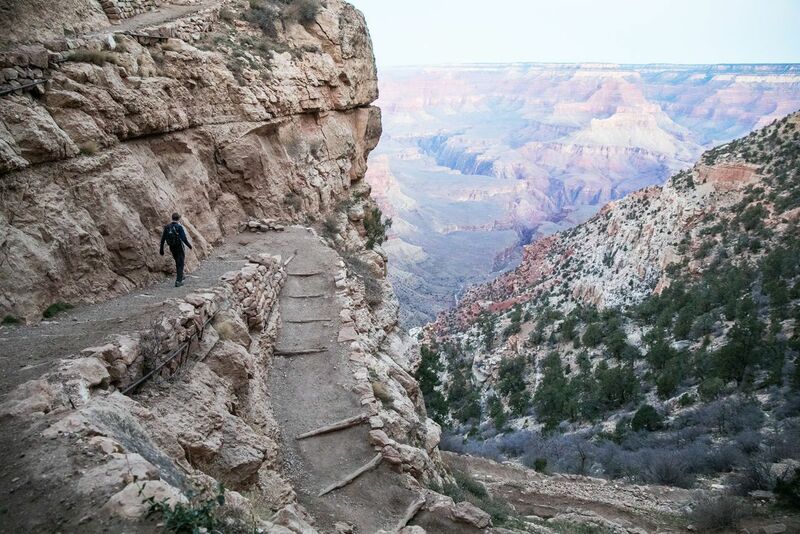 Just keep putting one foot in front of the other and eventually you will reach the top of the Bright Angel Trail. From the Bright Angel Trailhead, enjoy the view and take a few celebratory photos. Our original plan was to do this hike on Christmas day as a family. However, Kara was recovering from an injury so she had to sit this one out. On Christmas Eve, Tyler and I did this as a day hike while Tim and Kara went on a helicopter ride over the Grand Canyon. The morning started off cold, with temperatures in the teens. Later in the day, the high temperature reached 52°F in Grand Canyon Village. This was great weather for hiking. We never got hot and we didn’t sweat very much, which meant that our demands for water were low. Tyler and I each carried 3 liters of water and maybe drank 2 liters during the hike. We did have to be fast since limited daylight was a big factor. Sunrise was 7:30 am and sunset was at 5:15 pm. That gave us about 10 hours of daylight. But we did this fast. Tyler and I did the entire hike in 6:48, including time to take photos, eat, and use the restroom. The first seven miles goes fast. Since it is all down hill, it is easy to keep a fast pace. However, the views from the South Kaibab Trail are so spectacular that we stopped a lot for photos. Our fastest section was on the Bright Angel Trail along the Colorado River and up to Indian Garden. It’s an uphill walk but not overly steep so we kept the same pace as on the South Kaibab Trail. Plus, the views on this part of the Bright Angel Trail are nothing special, so we took very few photos. 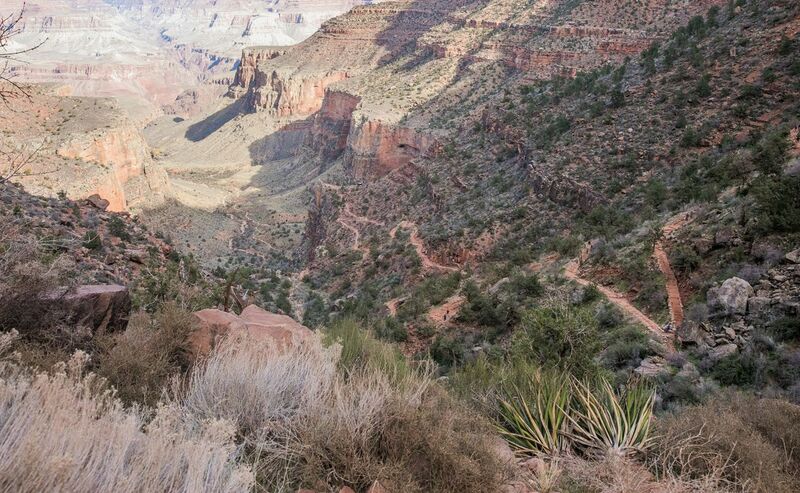 The final four miles on the Bright Angel Trail take the longest. By now, you’re most likely feeling wiped out and those last, steep switchbacks really slow you down. At the end of the hike, my Garmin watch told me that I just climbed 899 floors. If you were going to climb up the Empire State Building, it’s only 102 floors to the top. Imagine doing that almost 9 times. 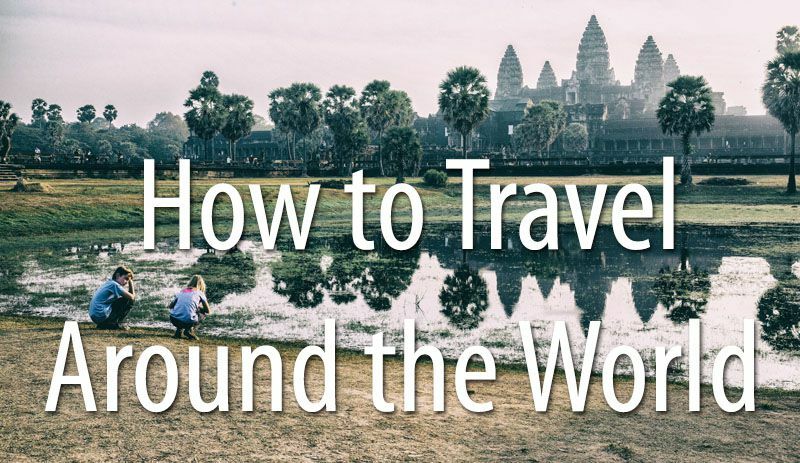 We have now hiked a lot trails around the world and I would say that this is the most challenging day hike we have done (so far). In 2017, we hiked Half Dome in Yosemite as a day hike. The Half Dome hike is roughly the same distance but has slightly more elevation gain than this rim-to-rim hike. Even so, I say that this hike is slightly more difficult. What makes hiking the South Kaibab and Bright Angel Trail so hard is the elevation profile. By the time you get to the Colorado River your legs are already feeling fatigued. Those same muscles now have to get you back up to the rim. This is a true test of your endurance and you need to come prepared. If you are hiking the South Kaibab and Bright Angel Trail in one day, you need to be a very fit and fast hiker. Before doing this hike, I was doing long runs of 8 miles with shorter runs during the week. I also swim and bike several days a week. Tyler runs Track and Cross Country and he has a very high level of physical fitness. Honestly, I struggled to keep up with him. 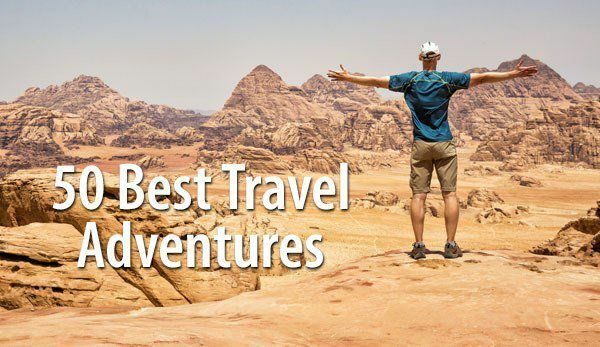 You also need to have hiking experience. There are no technical sections and the trail is so well marked that it would be almost impossible to lose your way, but it helps to have experience doing big climbs and big descents. This is not a good hike for beginners since it covers such a long distance with so much elevation change. If you plan to do this hike, you need to be in great physical shape. You should be able to walk 10 miles while wearing a backpack with little difficulty. You need to be prepared for lots of elevation change and if you are doing this from May to September, you also need to be prepared to hike in temperatures reaching over 100°F. I also recommend spending some time on a Stairmaster. I did not do this but I think it would help a lot, especially during the final three miles of the Bright Angel Trail. The best months to do this are in the Spring and Fall. Temperatures are pleasant and just as long as you are not here on a holiday weekend, crowds should be low. The summer is the worst time to attempt this as a day hike. Soaring daytime temperatures can create a dangerous situation. Your water demands will be very high and you run the risk of getting heat exhaustion or even heat stroke. Winter can be a great time to do this hike but snow can make the trails slippery and potentially create a dangerous situation. 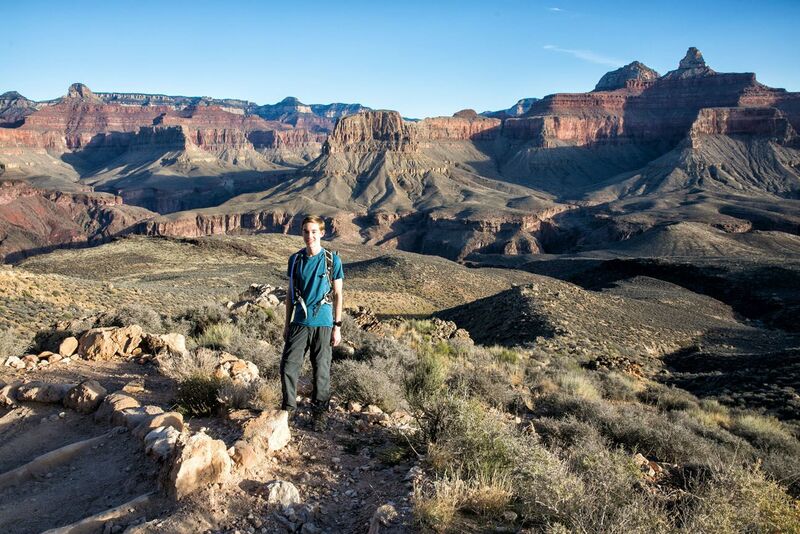 When we did this in December, there was some snow and ice on the first section of the South Kaibab Trail. If we did this again, I think that November would be a great time to do this hike. It’s cool but not too cold. Crowds will be low (aside from the days around Thanksgiving). And you have more daylight than during the winter months. I also wear a Garmin Fenix 5s watch. This is one of my new favorite gadgets. While hiking, I had instant access to all kinds of numbers like altitude, heart rate, time and distance. It even shows the hiking trail and our location on a map. 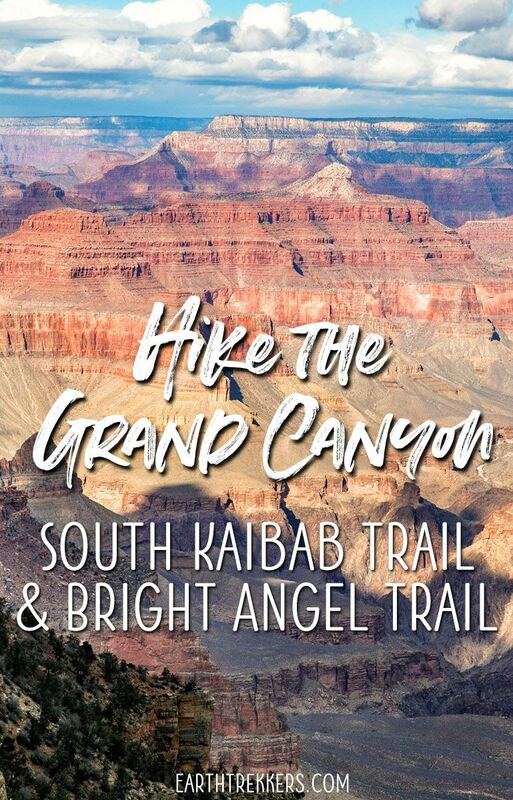 You can hike these trails in either order, but there are several good reasons to hike down the South Kaibab Trail and up the Bright Angel Trail. 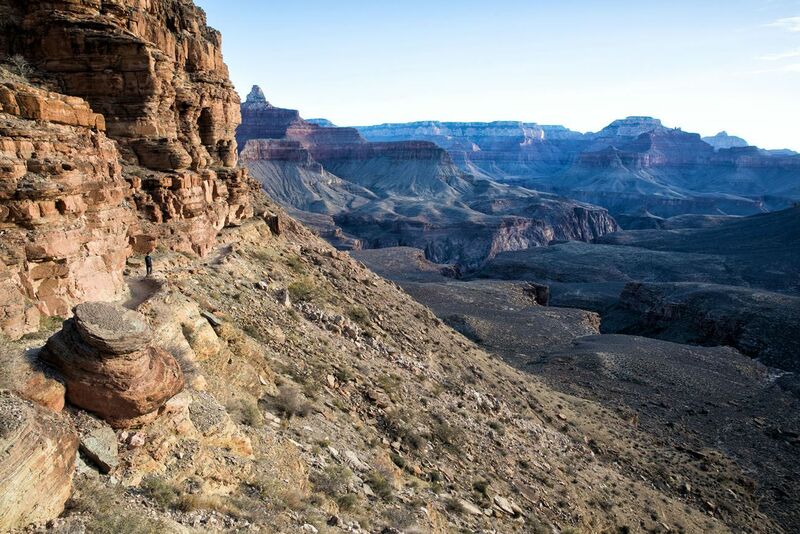 The South Kaibab Trailhead sits 400 feet higher than the Bright Angel Trailhead. 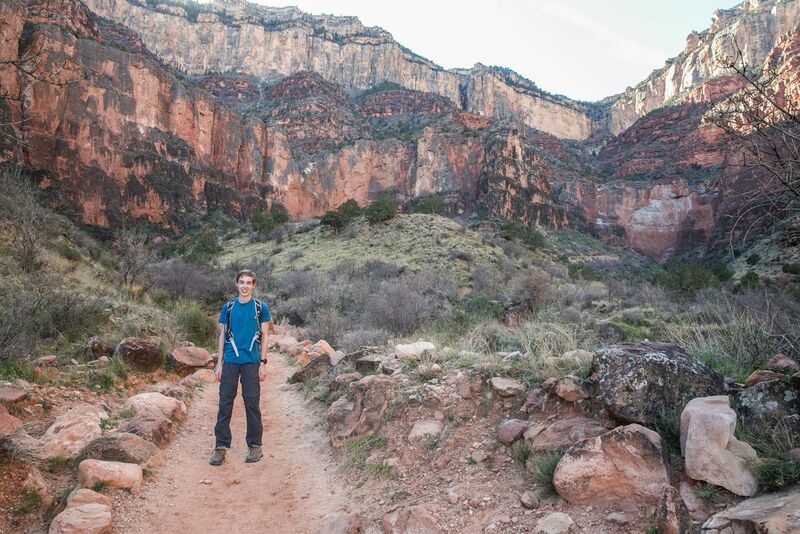 By starting on the South Kaibab Trail, you eliminate a nice chunk of climbing from the hike. 400 feet really makes a difference! With less elevation gain and a slightly longer trail, the hike up Bright Angel is easier than South Kaibab. 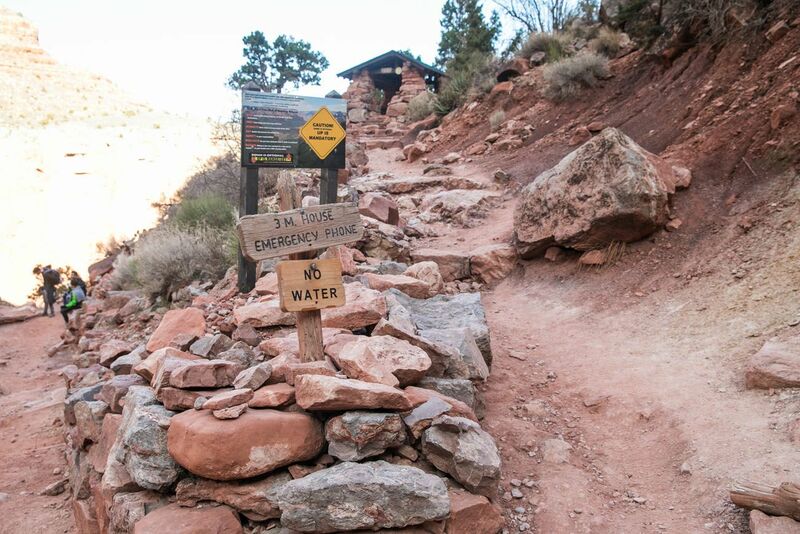 There is no potable water on the South Kaibab Trail. 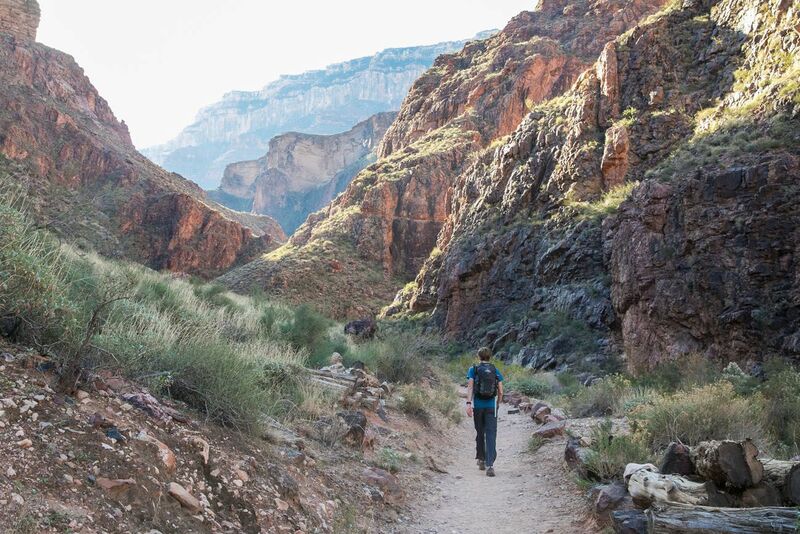 If you are doing this during the warmer months, you will need to carry every drop of water with you if you plan to hike up the South Kaibab Trail. 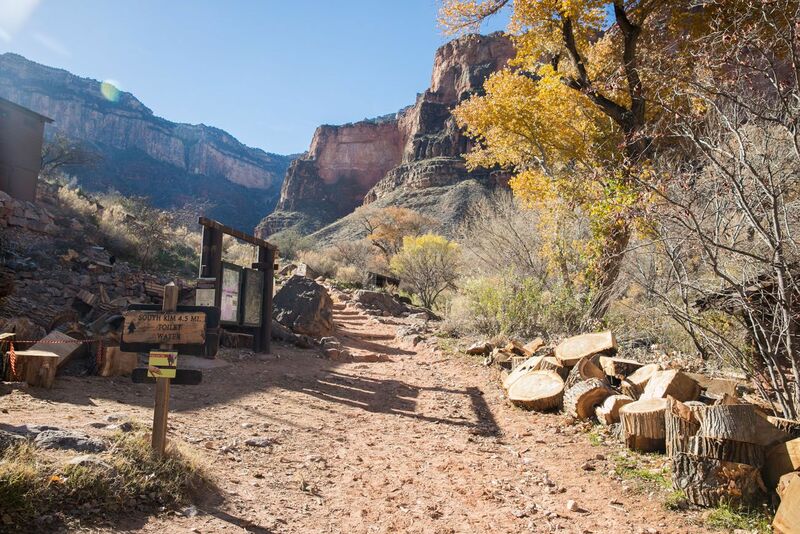 However, on the Bright Angel Trail, there are a handful of rest houses strategically placed on the trail where you can refill your water bottle. Since you will need the water more on the climb up than on the hike down, it’s a very good idea to finish the hike on the Bright Angel Trail. Start early in the day. This will give you the maximum amount of daylight. And if you are here when the weather is warm, you can knock out a portion of the hike before the temperatures really heat up. Eat frequently. Tyler and I ate a snack roughly every hour to hour and a half while hiking. This steady supply of calories kept us fueled up for the final climb. Eat salty snacks and drink plenty of fluids to stay hydrated. There is potable water on the Bright Angel Trail but I have heard that it is not always available. You can get updated information about the available water sources in the Visitor Center the day before your hike. We stayed at The Grand Hotel in Tusayan. It is the highest rated hotel in the area. The hotel looks impressive from the outside and the lobby is very nice but the rooms are nothing special. On Booking.com it is listed as a 5-star hotel but it looks and feels a lot more like a 3 to 4 star hotel. However, the rooms are clean and quiet and fit our needs. Did we miss anything? If you have questions or want to share your experience, comment below! 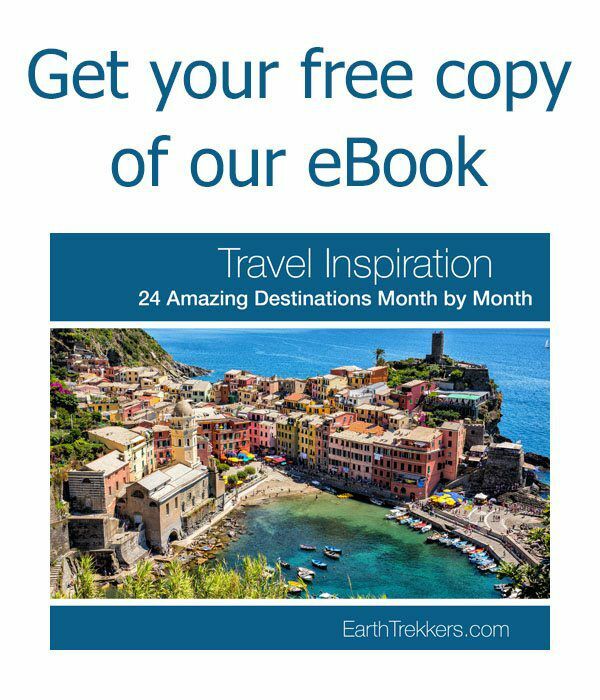 Planning a trip to Arizona? 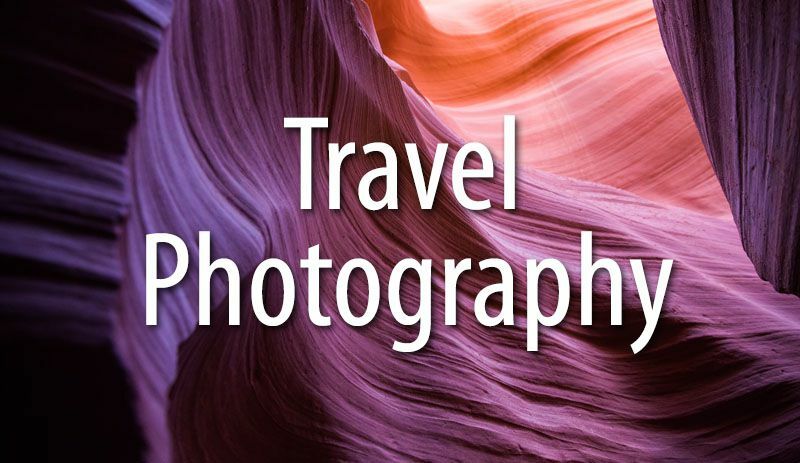 Read all of our articles in our Arizona Destination Guide. Are there any steep areas eg. sharp or narrow path or turns where you could fall off the cliff . I just completed the South Kaibab to the river and back to the top via Bright Angel this past Saturday. Yes, it was long and tiring. I won’t do it again until I’ve dropped 50lbs and can do the stepper at the gym for an hour 3-5 times per week. Does anyone have a KML file (Google Earth) of this hike? Took me 14 hours, left at 7:15 and was at the top at 8:50 or so. Lots of stops. Do not recommend as a day hike. Is possible, I am 14 and completed it with my father in 10 hours via phantom ranch as a day hike. It is however very strenuous and dangerous as it is easy to go down the canyon and not make it back up before sunset. We left around 8 am in late March, and it was still extremely hot at the bottom of the canyon mid day. Do not do this hike in the summer. Bring lots of water (and I mean LOTS) and snacks for the trail as well. Make sure you have done a few longer hikes before and are athletically capable. It is not for most people, but if you do it, it is spectacular. Just wanted to say that this is a great summary of all the info out there. Thanks for doing such a thorough report from your own first-hand experience. I’d say about my only question/comment is I’m wondering if Uber or Lyft can provide rides between the two locations. From what limited info I’ve come across, I think the answer is yes, but I’m still not 100% certain. Pulling up the 2 apps, it appears that Lyft is available but Uber is not. Since the shuttle only runs once an hour, I may try to use this as an option.